Thanks to my friends Haley and Jay for the idea! Logos belong to their rightful owners. Three of the four elements are represented in types of hockey; Air hockey (air), field hockey (earth), ice hockey (water). Fire hockey needs to be a thing. Fire hockey already exists. 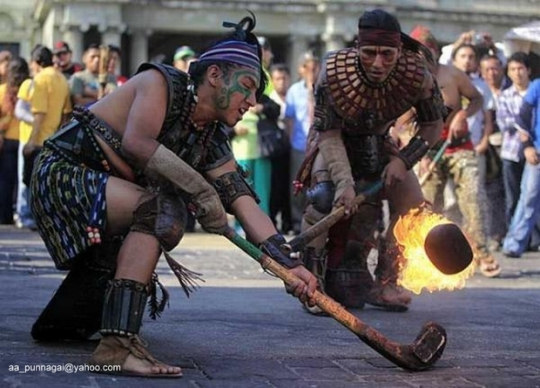 Welcome to pelota purépecha, or Mayan Fireball hockey. …this is the most awesome thing I’ve ever seen. Be more adorable. I dare you. You finished practice with an entertaining drill, were you at all surprised the grinders won that race? It’s really just a drill for teamwork. Somebody on those teams have to take leadership and they didn’t. I found it interesting. Because the only way you succeed at that is if somebody becomes the leader of that group and dictates it. The one group totally failed the test.